Storage bridges are an indispensable part of today's computing ecosystem. Internal ones may enable different I/O ports in a motherboard, while external ones are responsible for a variety of direct-attached storage units. These may range from low-performance flash drives with an USB interface to full-blown RAID towers interfacing over high-performance links such as Thunderbolt 3. While Thunderbolt 3 remains a premium Intel-only interface for now, USB 3.1 Gen 2 has emerged as a mass-market high-performance alternative. It is available across systems based on chipsets from multiple vendors. 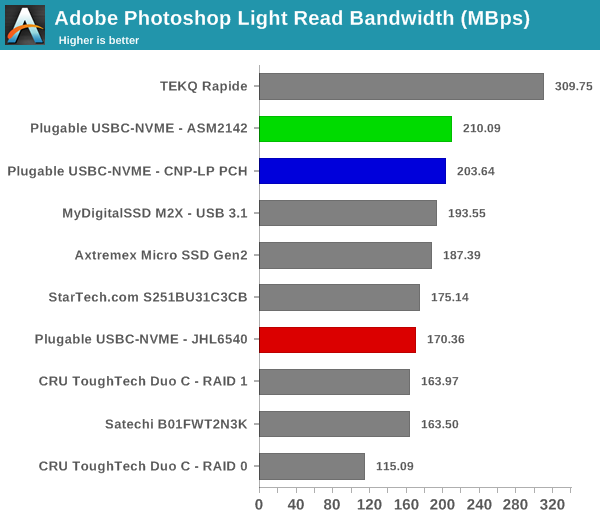 In this context, high-speed USB 3.1 Gen 2 storage bridges are interesting to analyze. Today, we look at Plugable's USBC-NVME NVMe SSD enclosure that bridges a PCIe NVMe device (M.2 2280 or smaller) to a USB 3.1 Gen 2 Type-C interface. High-performance bus-powered USB 3.1 Gen 2 storage devices have traditionally belonged to one of two categories - a SATA SSD behind a USB - SATA bridge, or, a couple of SATA SSDs behind a USB-to-dual-SATA RAID bridge. The first category is still bottlenecked by the SATA interface, and typically delivers 500 - 550 MBps of throughput. The second category can come close to saturating the USB 3.1 Gen 2 interface. However, it depends heavily on the workload type. In order to consistently take advantage of the interface across a variety of workloads, it is necessary to place a PCIe 3.0 x2 or better NVMe SSD behind the USB interface. Bridges with this feature were introduced by JMicron and ASMedia at Computex 2018. We have already reviewed the MyDigitalSSD M2X M.2 NVMe SSD Enclosure based on the JMicron JMS583 bridge. The Plugable USBC-NVME enclosure we are looking at today is also based on the same bridge chip. It can accommodate a M.2 2230 / 2242 / 2260 / 2280 NVMe SSD. The aluminum enclosure comes with two 25cm cables - a Type-C to Type-C, and a Type-C to Type-A . Both are rated for 10 Gbps operation. Plugable also supplies three thermal pads, and rubber pegs (one for each supported M.2 SSD size). The SSD can be installed in a tool-free manner since the casing is fastened to the bridge-chip-bearing frame by a spring-loading mechanism. The installed M.2 SSD is held in place by the aforementioned rubber peg. We put in a MyDigitalSSD SBX 1TB PCIe 3.0 x2 NVMe SSD for performance evaluation. Note that this is the same SSD that was used to evaluate the MyDigitalSSD M2X enclosure. 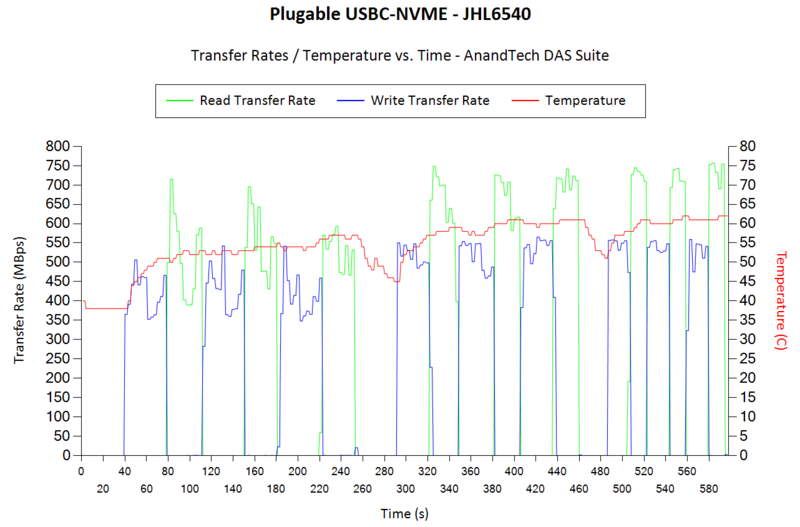 In the rest of this review, we compare the Plugable USBC-NVME with a host of other storage bridges (including the TEKQ Rapide Thunderbolt 3 enclosure). 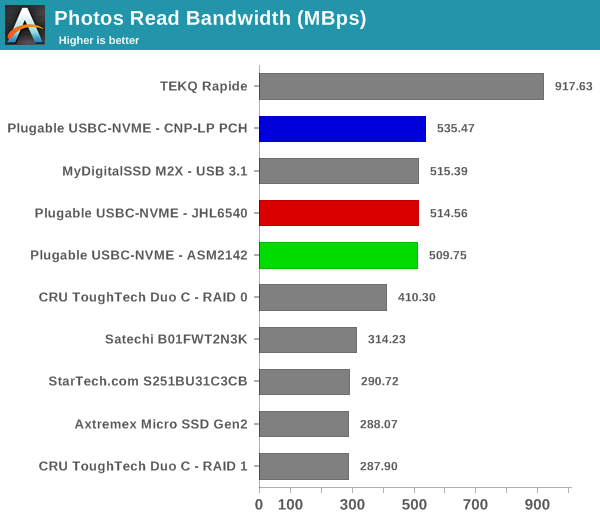 Note that only the MyDigitalSSD M2X belongs to the same specific category as the Plugable USBC-NVME. The table below presents the detailed specifications and miscellaneous aspects of the units and how they compare. All the storage bridge review numbers recorded in this page for units other than the Plugable USBC-NVME were obtained using our standard Skylake-based testbed hardware. However, we have opted to do things differently with the Plugable USBC-NVME. Given that the platform for the product is the same as the MyDigitalSSD M2X, it is likely that the benchmark numbers for quick tests are going to be the same. Differences might start to appear in the long-term robocopy benchmarks due to the difference in the thermal behavior. In the M2X review, we had looked at the performance of the enclosure with different USB ports (3.1 Gen 2, 3.0, and 2.0). For the Plugable USBC-NVME, we opted to test with different USB 3.1 Gen 2 host ports, as described in the next section. Our evaluation routine for storage bridges borrows heavily from the testing methodology for direct-attached storage devices. CrystalDiskMark is used for a quick overview, as it helps determine availability of UASP support and provides some performance numbers under ideal scenarios. Real-world performance testing is done with our custom test suite involving robocopy benchmarks and PCMark 8's storage bench. In this review, we are focused on the USB 3.1 Gen 2 ports available in contemporary computing systems. Some of the early USB 3.1 Gen 2 ports were enabled by the third approach in the above list. For example, the ASMedia 1142 bridges 2x PCIe 2.0 or 1x PCIe 3.0 lanes to two USB 3.1 Gen 2 ports. Intel's own Alpine Ridge Thunderbolt 3 controller bridges 4x PCIe 3.0 lanes to a Type-C port that can act either as a Thunderbolt 3 Type-C, or, a regular USB 3.1 Gen 2 Type-C host (depending on the downstream peripheral). The second approach started making its appearance with the introduction of the AM4 desktop chipsets from AMD, and the Z390 chipset on the desktop / Cannon Point-H/-LP PCH on the mobile side from Intel. Usually, the number of USB 3.1 Gen 2 ports directly from the PCH is limited, and vendors may continue to use the third approach to enable additional high-speed ports. ASMedia continues to be a popular vendor in the bridge space, as evident from the widespread use of the ASM 2142 in various PCs introduced over the last year. The Plugable USBC-NVME enclosure with the MyDigitalSSD SBX 1TB drive installed was subject to our evaluation routine with each of the above ports in the specified order. Comparing the '4K Q32T1' and '4K' numbers can quickly tell us whether the storage device supports NCQ (native command queuing) / UASP (USB-attached SCSI protocol). If the numbers for the two access traces are in the same ballpark, NCQ / UASP is not supported. This assumes that the host port / drivers on the PC support UASP. We can see that UASP support is availabl across all three hosts. Strangely, with the same internal SSD and host system, the Alpine Ridge port fares worse than the ASM2142 port. 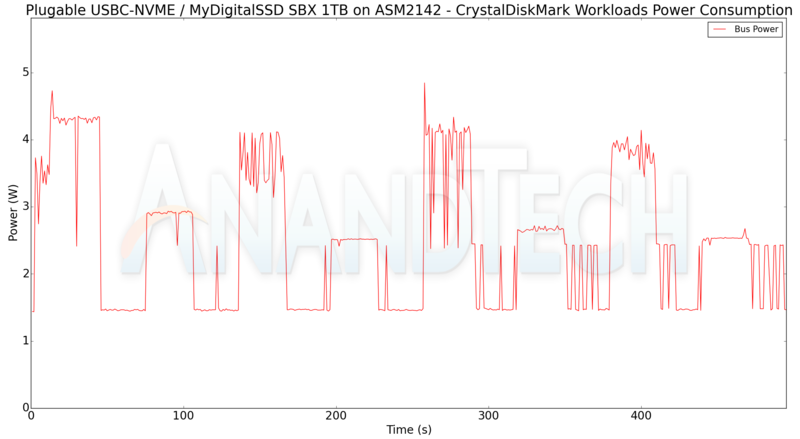 Contrary to popular perception, it appears that the ASM2142 has better performance compared to the Thunderbolt 3 port's USB 3.1 Gen 2 functionality for this particular set of CrystalDiskMark workloads. The Cannon Point-LP port (on a completely different system) performance comes in-between the other two, though it leans slightly towards the ASM2142 numbers. The test starts off with the Photos folder in a RAM drive in the testbed. 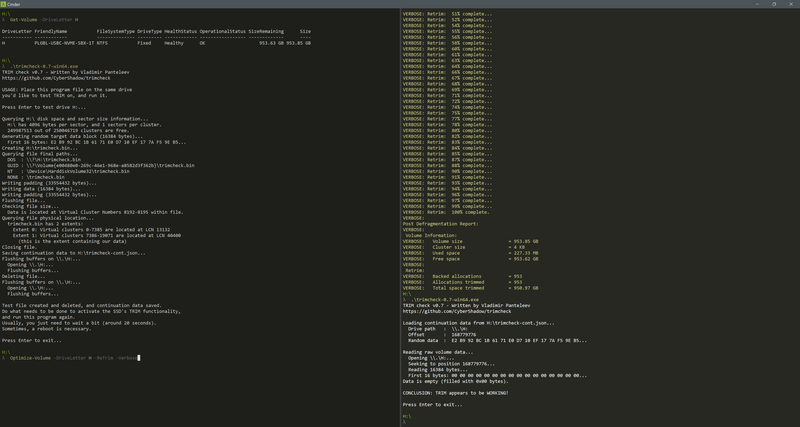 robocopy is used with default arguments to mirror it onto the storage drive under test. The content on the RAM drive is then deleted. robocopy is again used to transfer the content, but, from the storage drive under test to the RAM drive. The first segment gives the write speed, while the second one gives the read speed for the storage device. The segments end with the purge of the contents from the storage device. This process is repeated thrice and the average of all the runs is recorded as the performance number. The same procedure is adopted for the Videos and the BR folders. Readers interested in looking at all the graphs in one shot can choose the 'Expand All' option in the dropdown menu. Based on the results from the CrystalDiskMark tests, we expect the ASM2142 to comfortably win all the benchmarks, but, the numbers below indicate that the Cannon Point-LP PCH and the ASM2142 are actually quite similar in real-world performance (coming out on top in 3 benchmarks each). The numbers also serve to confirm that the MyDigitalSSD M2X and the Plugable USBC-NVME perform similarly when the Alpine Ridge-enabled Type C port is used. The above numbers also reflect the similar real-world performance for the ASM2142 and CNP-LP PCH ports. The thermal design of external storage enclosures has now come into focus, as high-speed SSDs and interfaces such as USB 3.1 Gen 2 can easily drive up temperatures. This aspect is an important one, as the last thing that users want to see when copying over, say, 100 GB of data to the drive inside the enclosure, is the transfer rate going to USB 2.0 speeds. In order to identify the effectiveness with which the enclosure can take away heat from the internal drive, we instrumented our robocopy DAS benchmark suite to record various parameters while the robocopy process took place in the background. Internal temperatures can only be gathered for enclosures that support S.M.A.R.T passthrough. Readers can click on the graphs below to view the full-sized version. The good news is that we do not see any thermal throttling in this test involving more than 240GB of continuous transfers. That said, we do see the temperature of the internal SSD reaching 60 - 65C at the end of the test. The ones completing the transfer faster end up with a higher temperature, as expected. 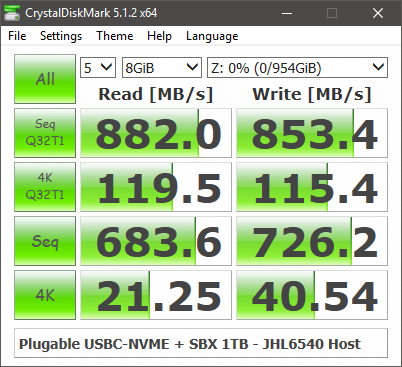 Compared to the MyDigitalSSD M2X's 56C at the end of the test with the JHL6540, we find that the Plugable USBC-NVME ended up at 62C, despite taking a slightly longer time to complete the benchmark. Based on this, we can conclude that the thermal solution of the M2X is slightly better than the USBC-NVME. However, it has to be kept in mind that the M2X is not a tool-less solution. The above results were on expected lines - while assembling the M2X, we found that the thermal pad mounted on the SSD made good contact with the aluminum casing (to the point that we even found it a bit difficult to remove the SSD after mounting it). On the other hand, the USBC-NVME came with three thermal pads that were stuck on the SSD prior to mounting it on the board. These pads do not seem to be making full contact with the case. Rather, Plugable is relying on the perforations on either side of the case to enable air-flow and aid in bringing down the temperature. The upside is that it is very easy to take out a SSD and put in a new one in the USBC-NVME, compared to the M2X. It is challenging to isolate the power consumption of the storage bridge alone while treating the unit as a black box. 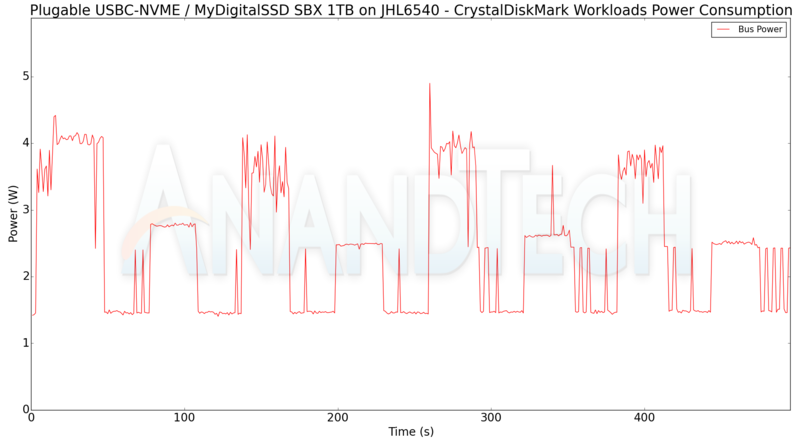 In order to study this aspect in a comparative manner, we use the same SSDs (the MyDigitalSSD SBX 1TB) in the units and process the same workloads on them (CrystalDiskMark 5.1.2's benchmark traces with a region size of 8GB and the number of repetitions set to 5). Plugable's USBC-TKEY power delivery sniffer was placed between the host PC and the storage bridge to record the power consumption. The power consumption over time is graphed below. Any difference in power consumption for the same access trace between two different units is down to the storage bridge itself (since the drive used is the same in all cases). Peak power consumption for the USBC-NVME with the JHL6540 and the ASM2142 was around 4.8W (same as the MyDigitalSSD M2X). The USBC-NVME idled at around 1.5W on both of our test systems, compared to the 1.2W number for the M2X (albeit, on a different testbed). We can't reliably conclude whether the difference in the host system (our custom Skylake testbed against the Hades Canyon NUC) is responsible for the lower idle power of the M2X, as it is also possible for the bridge firmware to be slightly different between the M2X and the USBC-NVME. SATA - USB storage bridges that support UASP fully can translate the SCSI UNMAP command to TRIM commands for SSDs connected to the downstream port. In the case of M.2 NVMe - USB storage bridges, the bridge chip has to recognize the corresponding NVMe command and pass it downstream appropriately. 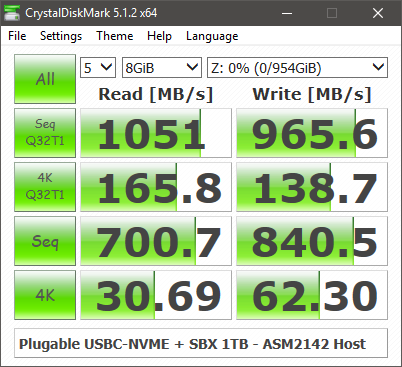 We find TRIM working in the Plugable USBC-NVME with the MyDigitalSSD SBX 1TB SSD, as expected. 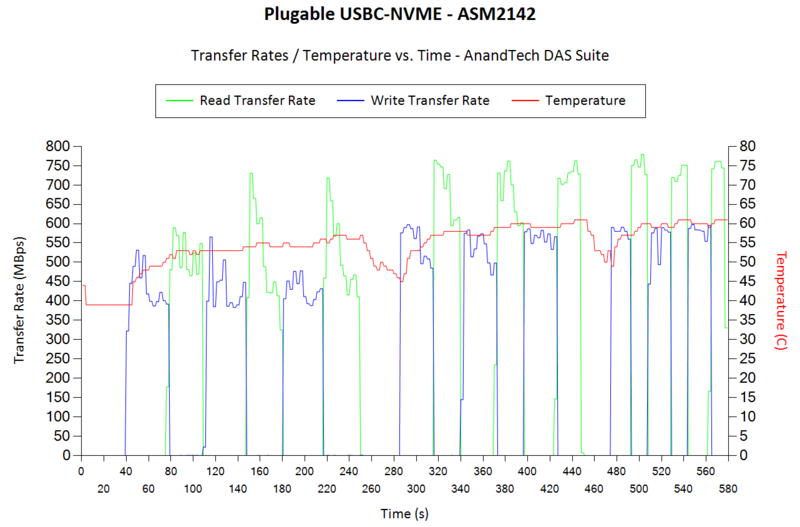 Our evaluation of the Plugable USBC-NVME had two aspects - the comparison of different USB 3.1 Gen 2 hosts currently in the market, and the comparison of the product itself against the MyDigitalSSD M2X enclosure. Our benchmark numbers have shown that the ASMedia ASM2142 and the Cannon Point-LP PCH's implementation of the USB 3.1 Gen 2 perform very similar to each other. Alpine Ridge / JHL6540 turned out to be an also-ran. To its defense, the DHL6540 / JHL6540 controllers have been around for more than a couple of years now. Evaluation of the newer Titan Ridge controller for similar workloads may yield numbers similar to what we obtained for the ASM2142 and CNP-LP PCH. The Plugable USBC-NVME is perfect for consumers who need to mount and dismount M.2 NVMe SSDs frequently. An example would be a scenario where a user needs to quickly identify the contents in a M.2 NVMe SSD prior to formatting for installation in a PC. The tool-less aspect is a major contributor to this aspect. The downside is that the thermal performance is not as good as that of the MyDigitalSSD M2X.The M2X is more suitable for use-cases where the installed SSD needs to be swapped out very rarely. Despite using the same bridge chip (JMicron JMS583), the enclosures excel for different use-cases. As of the time of posting this review, Plugable has sold out of their initial stock of the USBC-NVME enclosure. The next shipment is on the way, and should be available again on Amazon for USD 50 shortly. The pricing is a bit higher than the USD 40 for the MyDigitalSSD M2X. Consumers can go in for either enclosure based on their intended use-case. If you want the device to be bus-powered, it is unlikely you are going to get multiple NVMe SSDs in a USB 3.1 Gen 2 enclosure. unfortunately, these devices still don't allow software like Samsung's clone software to work as they don't show up as a Native Samsung SSD -- see the following from their tech folks. Thanks for asking! The Samsung Data Migration software will not recognize a Samsung SSD in the USBC-NVME enclosure as a Target Disk. While the Samsung Magician does recognize the NVMe SSD in the USBC-NVME enclosure’s model number, Serial number, and firmware in the System Information, limitations in the Samsung Data Migration software prevent cloning to the NVMe SSD in the enclosure. I am sorry this will not work with the Samsung cloning software, please let me know if you have any additional questions.